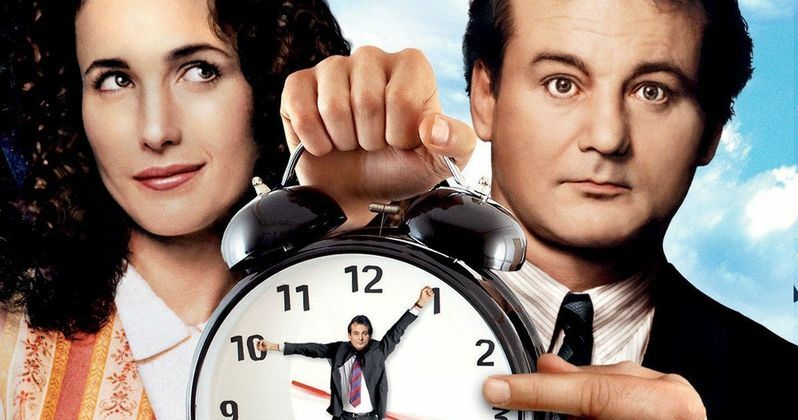 Groundhog Day is an undisputed comedy classic. It never got a sequel, because frankly, it didn't need one. But we have been treated to a number of movies throughout the past couple decades since its release, that use the concept of having to relive the same day over and over again. And most have been successful, including Tom Cruise's Edge of Tomorrow, the Blumhouse horror franchise Happy Death Day and the current Netflix hit Russian Doll. But someone, somewhere decided that Groundhog Day does need a sequel. Only it won't be a movie this time around. Groundhog Day 2, if you can call it that, will be a virtual reality game set in the same universe as the Bill Murray original. It was created by Tequila Works in partnership with Sony Pictures Virtual Reality. Groundhog Day: Like Father, Like Son follows Phil Connors Jr., the son of Bill Murray and Andie MacDowell's Phil Connors and Rita Hanson. The story unfolding in the game is the same as the 1993 Harold Ramis directed comedy. Players are stuck in the same single day, trapped in the Connors' Punxsutawney home until the younger Phil can truly learn the value of friendship and family. It sounds like a pretty odd game. Groundhog Day: Like Father, Like Son is Sony Pictures Virtual Reality's first go at branching narratives and interactive VR storytelling. Jake Zim, senior vice president of the Sony Pictures VR group, said this about the game, assuring fans that this wasn't meant to stir up publicity for a true movie sequel, which is definitely not happening. At least not yet, anyway. "We are not developing a new Groundhog Day movie. This is us expanding the storyline into a new format. We've taken Groundhog Day and put it into a musical, now we're putting it into an immersive experience." Sony Pictures VR hopes to become a profitable business model in the near future, as it uses familiar titles to open up a new realm of interactive and immersive entertainment. Virtual Reality is the main focus for now. Zim went onto say this. "We have the ability to flex and pivot as much as we need to. That has allowed us to work within Sony to do deals with companies like the Void (which teamed up with Sony to create a walk-through virtual reality 'Ghostbusters' experience), or create something for multiple platforms, or work in the immersive theater space." The company hopes that fans are willing to pay for a game such as Groundhog Day: Like Father, Like Son, and that they can compete with others in the market place. "When we launched this business three years ago, we thought we would build small bite-sized games with movie IPs and see what price point we could get up to. But we learned that wasn't what the audience wanted. Groundhog Day' is a real attempt to make a real game." Tequila Works, based in Madrid, Spain, was chosen to help out, because they were familiar with time loops, and could give Sony what they needed on the budget they had to work with. The game has 'a complex intertwined narrative'. The game is set for release later in 2019, and will be available for PlayStation VR, Oculus Rift, and HTC Vive. There will also be a version brought to the Oculus Quest. The narrative driven game contains actual dialogue and 'event-driven interactivity that opens up new paths, new character interactions, new puzzle moments, and flashbacks as you continue to tell your story'. Zim had this to say, comparing it to the original movie. "You're essentially trying to resolve all of the problems you've brought with you, to solve the day," he said. "It's definitely still a comedy, a dark comedy." The entire game will run for approximately 8 hours. Zim refused to confirm if Bill Murray is reprising his role as Phil Conners, contributing voice work for the game. That will presumably be revealed at a later date. If the game is a success, there is a possibility that it will be revamped for non-VR gaming platforms. There are two other projects currently being developed for the PlayStation VR and other similar platforms. "We have a lot of stuff in the pipeline. We look at upcoming theatrical releases and find ways to develop games around that, but we also look at our whole catalog, our library and try to find IP that would fit into gaming. Ultimately, the goal is to find more worlds that could become immersive." At this time Groundhog Day: Like Father, Like Son doesn't have a set release date. We'll have to wait and see if Bill Murray comes out of his hidey hole to see his own shadow on this one. Who knows, if it turns out to be popular enough, maybe we will see a movie sequel after all.